3933 In Stock Assorted designs - surprise me! A set of 3 toys that can be positioned on the pushchairs bumper bar, on the cradle or on your child’s infant car seat handle. 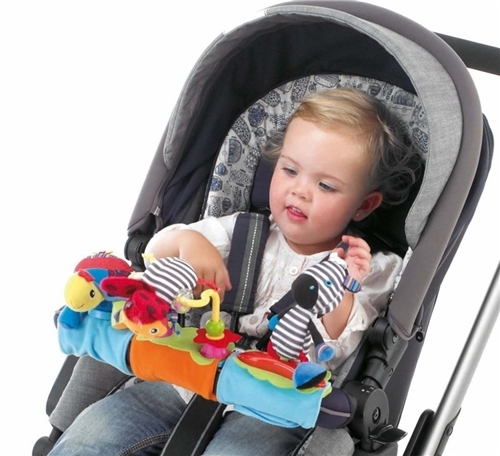 The 3 toys can be positioned together or used independently of each other using their velcro straps. They will keep your baby entertained while going for walks. Assorted designs to amuse your child. NOTE :Colours and designs are assorted, Farm, Jungle Adventure, Circus etc. Unless stated above, only one design will be sent, picked at random. Realy good for the pushchair they keep my baby entertained for a wile! They look realy good on the pushchair bar I think is worth the money!